The International Day of Happiness was established in 2012, when all 193 Member states adopted UN resolution 66 281:“International Day of Happiness”. 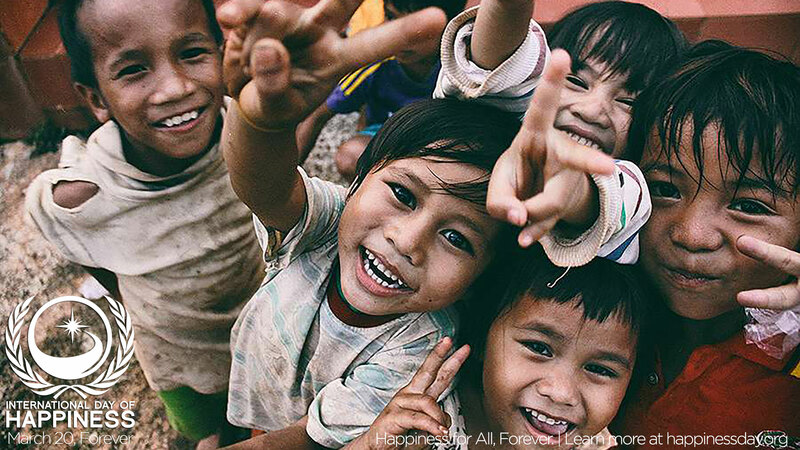 The first International Day of Happiness was celebrated on March 20, 2013. Every year since, more than 7 billion people across the planet share in celebrating this special day, through social media, local, national, global, and virtual events, UN related ceremonies and campaigns, and independent celebrations around the world, consistent with Article 2 of UN resolution 66 281, and the spirit of UN resolution 65 309. Happiness Day™ and International Day of Happiness™ are registered trademarks of Illien Global Public Benefit Corporation. They are managed in partnership with the United Nations and freely shared with global citizens through Creative Commons licensing. Happiness Day, Inc is. a U.S. based 501(c)(3) not-for-profit organization whose sole donor is the Illien Global Public Benefit Corporation. The International Day of Happiness logo is licensed under a Creative Commons Attribution-NonCommercial-ShareAlike 3.0 Unported License.